Turquoise and Turquoise Jewelry have been highly desireable for many, many centuries by people all over the world. This Turquoise facts section of the site will help you find the locations of mines and sources of Turquoise. Most Turquoise deposits are in arid to semi-arid regions in igneous rock formations that contain high copper concentrations. Deposits of Turquoise can be found in America, Afghanistan, Africa, Armenia, Australia, Brazil, Chile, China, Egypt, Europe, Iran, Israel, Kazakhstan, Mexico, Russia, Siberia, Tanzania, and Turkey. There are Turquoise deposits in Arizona, California, Colorado, Montana, New Mexico, Nevada, Utah and Virginia. High Grade American Turquoise is of the greatest value around the world, second to none. American Turquoise has adorned many wonderful pieces of jewelry, sterling silver jewelry and gold jewelry alike. Turquoise Jewelry has adorned many people, from many countries for thousands of years. American Turquoise specimens are usually cut with the matrix in them, a good cutter tries to create a picture in the cabochon, the stones have black, white or brown matrices. Many times cutters around the world try to cut Turquoise from other countries and sell it as American Turquoise. 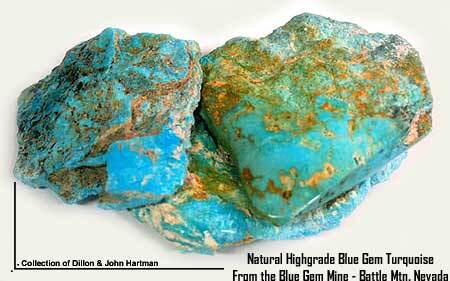 The Arizona copper mines-These mines are famous for many exquisite mineral specimens, including Turquoise. Virginia-Miners found the first examples of crystalline Turquoise in Virginia in 1911, but Virginia has never been a source for much gem turquoise. Mexico-Aztec Turquoise mines began operating between 900-1000 AD. Native American Jewelry is highly respected today. The major sources are in the Sinai Peninsula and Iran. Iran-The finest of the worlds Turquoise specimens come from the deposits in Northeastern Iran. The stones from here have the much sought after Robins Egg Blue with few or now streaks and are among the most valuable opaque gemstones. To no surprise Turquoise is the national gem of Iran. Sinai Peninsula-The Egyptians began mining Turquoise and making turquoise jewelry here as early as 5500 BC. Egypt-The history of Turquoise use in the Middle East coincides with the beginning of civilization itself. Turquoise mining began in the Sinai Peninsula around 5500 BC. The stones taken from these mines served jewelry, amulet and cosmetic purposes for millennia. In 1900, archaeologists who excavated the tomb of the Egyptian Queen Zer (5500 BC) found a Turquoise and gold bracelet on her wrist. These are the worlds oldest known examples of surviving turquoise jewelry. Persia-Around 3200 BC, the kings of Egypt began annual mining expeditions to the Sinai. In Persia, Archaeologists have found beads of Turquoise that date around 5000 BC. Turquoise Amulets from 600 AD contained carvings of Islamic and Persian Proverbs. The fine stones from this area were important sources of trade and were found in graves as far away as Turkestan and the Caucasus. These revered stones, so important to the Persian culture, were called Ferozah, which meant victorious. In modern times, Iran honors Turquoise as its national gemstone. By the middle of the first millennium, AD, China had begun using Turquoise and although they had mines in their empire, they imported most of their stones from Persians, the Turks, the Tibetans and Mongols. Chinese turquoise and Tibetan Turquoise is now one of most common varieties of turquoise on the market today. Much of the turquoise jewelry that you will see today in markets and galleries features Tibetan turquoise or Chinese turquoise. Japans use of Turquoise began in the 18th Century AD and has prospered greatly. Today the Japanese are some of the great collectors of turquoise and have been known to pay whatever it costs for the best, as the collectors only want the best turquoise, usually high grade Natural American Turquoise and Native American Turquoise Jewelry. Around 500 BC, inhabitants in Siberia had begun using the stone, But it did not gain favor with Western European fashion until the late middle ages when trade with the Near and Middle East had increased. The origin of the word Turquoise is French and comes from Venetian Traders, who bought it from the great bazaars in Turkey, though the Turkish traders brought it from the Persian mines. Shakespeares "The Merchant of Venice features a Turquoise ring. The Aesthetic Period (1880-1901) responded to the strict provisions of Queen Victorias mourning and jewelry became more whimsical; Turquoise played a large role in the jewelry of this period but played an even greater role during the Romantic Period (1837 to 1860). The light gold worked jewelry of this period contained fine gems that were often accented by Turquoise. Still to this day european people love turquoise jewelry, although now mainly set in sterling silver.